Welltrient Packs | Where Wellness & Nutrients come together. 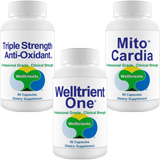 Well-Trients for Life | Welltrients® | Welltrients for Life, Inc.
Welltrient® Combo Packs utilize the powerful synergy between Welltrient ® products to satisfy a specific need. Every combo pack is developed for our professionals to have convient access to groups of products with a specific goal. Currently, we offer three combo packs consisting of a daily, digestive, and vision trio. Take One Capsule of each with a meal for maximum results! Digest Aid+™ is the highest quality digestive enzyme support supplement available. Digest Aid+™ is a dietary supplement formulated as part of the digestive team to assist your digestion and improve the assimilation of nutrients from food. Flora Complete™ is a proprietary formula of 15 different strains of probiotic bacteria blended to support healthy digestive function imperative for ideal absorption and utilization of nutrients. Probiotics help to re-establish a healthy balance of beneficial bacteria flora in the intestine. We experience better health and well-being when the colon is clean and functioning optimally. Colon CLNz™ is an extra strength colon cleanser, formulated with selected natural herbs that exhibit cleansing and peristaltic action in the large intestine. A clean healthy colon is essential for the elimination of toxins and waste from the body. 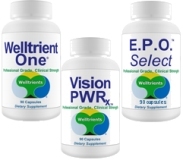 Vision Welltrients™ is an advanced, comprehensive nutritional support for your eyes. Our eyes need specialized nutrition, because their delicate tissues are continually exposed to light, making them vulnerable to free-radical damage. Fortunately, Dr. Bill's targeted Vision Welltrients™ is now available in a complete Vision Welltrient Pack™. Packed with eye supporting nutrients, the Vision Welltrient Pack™ is formulated to nourish your eyes continuously, and to provide proactive support for long-term eye health. Our eyes need specialized nutrition, because their delicate tissues are continually exposed to light, making them vulnerable to free-radical damage. Packed with eye supporting nutrients, the Vision Welltrient Pack™ is formulated to nourish your eyes continuously, and to provide proactive support for long-term eye health.